Copper alloy; Ring size 2, with Solar symbol = Soli Invictus. 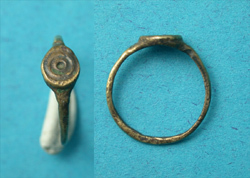 Con/ Cleaned and certainly wearable, this lovely child's ring needs a happy finger! Seller's Note/ The Soli Invictus cult became very popular with Roman soldiers during the 3rd-4th Cent AD and most likely the youth's father was a member of the same. Rings were made to be worn, not tucked away. The longer this ring is worn the better it will look!